Miltoncontact: Patchwork Quilts, a declining artform? "Duvets - If you are creative with a needle and thread or know someone who is, convert a thin duvet the into a patchwork to make a fantastic quilted gift! Note: get the old duvet cleaned to kill dust mites and reduce dust mite allergens before quilting. 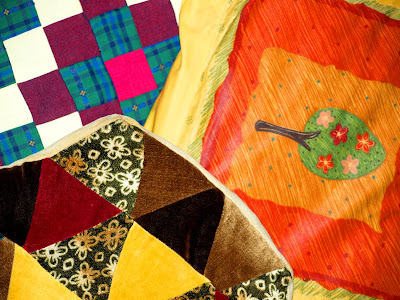 The presenters response implied that making patchwork quilts was not a likely activity in this day and age. This made me think, is this true? Am I an old fogey? My family enjoy the occasional craft (see my mothers patchwork cushions above)and I'm sure there is a quilting community. What is your opinion? Quilting/Patchwork quilts: Dead art or alive and kicking. please comment below! We made a quilt for the first time as a wedding present for a friend - but that was more than 20yrs ago! I associate this sort of thing with the Amish. I didn't realise anyone else did it.